Bottle believed to be from the Inauguration of Franklin Delano Roosevelt or Woodrow Wilson I The item is entirely made of Papier Mache. It measures 7.75 across at the base, 21" circumference at base and is 24" high. The cap is 2.5" across, with a 7.5" circumference. Owner would like to know the value. 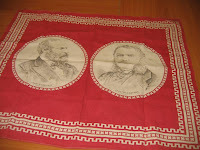 21"x17" fabric banner believed to be for the campaign of Garfield and Arthur for President. Excellent condition. Issue for the 1973 Inauguration of Richard Nixon. 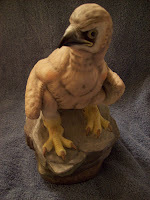 Baby Eagle produced by Edward Boehm. Says on the bottom that it is one of a special issue of one hundred. No box or leaflets. Owner is interested in knowing more about the item and selling it. This owner wants to: Sell the item. If you have information on this item to share please comment or send email to appraisals@loriferber.com. DETAILS FROM OWNER: This Jefferson gavel was used during the 1968 Convention in Chicago by Chairman Carl Albert. It is made from a 1770 white oak beam from Moticello and trimmed with an alloy of metals fro the orginal structure. It is Signed by Rep. John M. Murphy Parliamentarian. It is also sign by "Jack Murphy" and addressed to Jim O'Dea. Print of President Dwight D. Eisenhower in his Augusta National Golf Club Green Jacket. This remarkable portrait of Eisenhower was created by famed portrait painter and Eisenhower friend Thomas E. Stephens. The original painting upon which this print is based currently hangs at Augusta National Golf Club. This piece measures 24" wide by 20" tall (framed) and 19" wide by 15" tall (unframed). There is a small scratch that can be seen on Ike's arm.